The Adventures of Tioga and George: What's Happening? Why A Box Van Conversion? You may question the wisdom of a Box Van conversion. As you know about me, I love doing projects. Fixing something. Building something. That is my meat! I am not looking for the easiest or quickest way. I am looking for the most fun way! Little iPhone just took a pic of Box Van. Not necessary for me to write about what you see in that pic. Giovanni's Italian Restaurant "Since 1975"
I worked at straightening up Box Van's Big Mess for over 5-hours. I deserve a reward! So, I have treated myself to eat at Giovanni's. As I was walking to thru the parking lot, to the restaurant's front door, I passed the kitchen. The vent was blowing out the most fabulous "baking pizza" fragrance. Oh Lord! 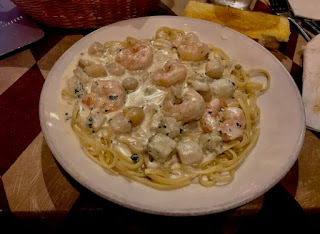 I ordered "Shrimp Linguini Giovanni" - Shrimp sautéed with olive oil, roma tomatoes, garlic and parmigiano cheese". I saved room for dessert! dessert drove me mad with delight! George, I would be hesitant (I wouldn't do it) to sleep in an area where a generator with gasoline is in the same room with me. Particularly bad if heaters and electrical connections are involved. You don't want to mess around with gasoline fumes! Please comment back at me and let me know why you wrote about a generator with gasoline being in the same room with me. I agree ... where will you store the red Honda generator and it's gas can? This the reason comments is so terrific for me! I have Readers asking questions that I have NOT thought of. I gotta address the generator and gas can question. Remember you will need windows and doors and lots of plumbing. We had a friend who started on a conversion, a friend who was in their 40s. It was just too many unexpected things that had to be done. The project never got finished. Not saying you shouldn't do it, just research all the unplanned revision and structural things that have to be done first. This van conversion project will not be a sustained effort for me. I will do things by priority. For example, the first thing to be done is to create a small living quarters area for myself that will be heated. Possibly, suspending a tarp from the Box Van's ceiling forming a small closed-off area might work. An olympian catalytic heater would provide safe warmth. A place for a propane bottle outside must be provided. The important thing for me is to be living inside the Box Van during this ongoing van conversion project. That is sound advice from Carol and Bill - while what you want to do is very interesting it just may be more then you think it is and could end up as an abandoned project - that would be sad. In my opinion, taking each project one at a time. Not looking at all the projects together for bringing Box Van's conversion to a completion. None of these projects is difficult. Box Van's conversion will be a joy for me to do! I am sooooo excited to begin it! George I think the old saying “you only live once” comes to mind here. I have been a reader since your early days and know when you set your mind on something it usually happens to one degree or another. Converting a box van into a an RV will require quite a few amenities to be installed, this will not be a simple task, but doable over time. Questions you need to ask yourself are can I install a bed, bathroom, fridge, stove, furnace, water and holding tanks complete with plumbing, cabinets, eating area, windows, ventilation, flooring and the list goes on. All these installations will require a certain degree of skill and knowledge to be properly executed not to mention a wide verity of tools. I think you have the ability to do most of these but it will not be a fast completion and some aspects of this project will have to be performed by outside sources. 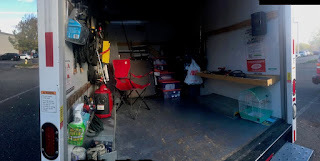 Another point of view/observation: would it not be a lot easier both physically and financially to buy a mid size class c and do a few alterations to add a small workshop area given that during the process you could still live comfortably in the RV. One thing I know, whichever direction you go you’ll enjoy the journey, just remember its easier to think long and hard about your decision then to fail at your endeavour. Your list of "things-to-do" for Box Van's conversion appear to be pretty accurate. However, here is the kicker! All that I have to do to begin living fulltime in Box Van is provide a heater for warmth and a portable toilet. That's all. Box Van already has my bed! PS: In my lifetime, "Failure has never been a option for me!" 1. will loose ability to unhitch from your home and drive around in a more nimble vehicle. 2. in order to be able to stand up inside, the van will be much taller than your present living arrangement... and you'll encounter low hanging trees, branches, etc. when out looking for out of the way boondocking opportunities. 3. While a little camper and van may not be totally stealthy, it's much less imposing than a larger box van. You may well be talking to the authorities more often. And boondocking in neighborhoods could make neighbors even more nervous. Often thieves use box vans for their loot. 4. If you have the space, you'll fill it with even more tools and gadgets. Could end up being much heavier than you'd like. You have and like the Scamp. It makes so much more sense (to me) to go back to plan A and buy the right tow vehicle. Other Readers express sentiments similar to your comment. Box Van has a 9 foot clearance. About the same as my dear departed, MsTioga. Thom, in my opinion, Box Van will become the stealthiest RV in the history of the World. I will cause Box Van to look like a delivery vehicle. Maybe put the word: FedRex on the side! Glad to see you back to being inventive. Along with the box van I hope you put some thought and time looking at doing the same thing with a full size van such as a Ford Transit. Seems like it would much easier to get in and out of, and you would have access from the driver seat same as a motor home. Handy if you have to change your stealth camping spot in the middle of the night. Good luck with whatever you decide. You are an inspiration. I owned a Ford Transit [Connect version]. The Ford is not even remotely comparable [In my opinion] to Box Van. One of the best things about Box Van is its height! Remarkable visibility while I am driving! George, I too have read you from the beginning. This box van idea is the worst idea on soooooooooo many levels. I truly hope you'll come to your senses. "He had to eat his words?" YouTube is loaded with box van conversion projects. My Box Van conversion will become a "Thing unto its self." It's "Wait and See Pudding!" You just have to wait and see! "I'd say a box truck conversion is a mistake in terms of cost, time to complete and your personal comfort during the conversion." I for one will miss The Scamp! Yes! Scampy is terrific. A fantastic trailer/RV. However, Box Van is a single vehicle that combines the great features of Scampy + Señor Tránsito in one easy to drive truck with wonderful visibility! Box Van will be the ultimate stealth RV. Because it does not appear to be an RV. But it is an RV! It will also be my workshop. My storage. By golly, Box Van will be my everything! Looking forward to this! That dessert looks crazy good! It sure looks as though I am able to fit my workshop and living quarters in a 10 foot box van! That is only 57 square feet! I may be living large in a very small way! Looks organized. Baby Boid's empty cage...sad. Couldn't you have rented a SUV and pulled Scampy to SoCal? Can you check your email I sent you a note BEFORE you leave for San Diego. I received an email from you. But I could not comprehend your text?! What were you wanting to tell me? After seeing Boids empty cage in the box van, I started browsing the Internet, I discovered a small animal rescue in WA that recently found two stray blue parakeets. Thinking it may be your beloved Baby Boid, I didn't want you to leave for San Diego until it was confirmed or denied. Late last night after sending photos of Boid it was determined by the color of his "band" it was not. Thank you sooooo much for caring! George, if you really are serious about this, then you have more money than Bill Gates, and your family and friends should hit you up for a loan! I may have enough $dough$ to last me to my endgame. I liked that first guy, who appeared to be, "Death Warmed Over!" Before you commit to a box van, please check out licensing and insurance for a commercial vehicle. It will not be a rv before you jump thru the hoops to make it so in the eyes of the dmv. Hi George... loved the FedRex item. Looking forward to your bathtub installation as well. Solar water heater. Rain water collector. A unique rv. You seem to have a rich imagination.